Not literally every square inch of the record shop, but close to it, will be covered with artwork. 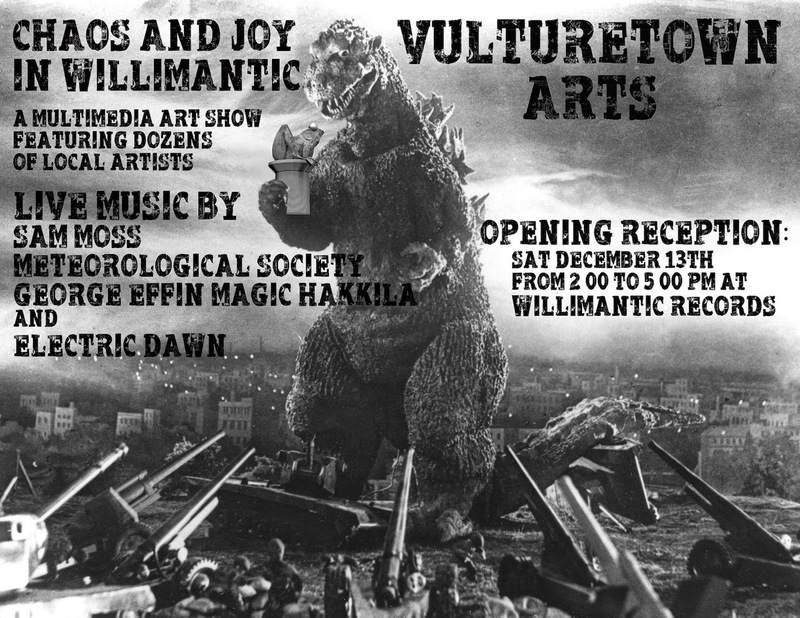 Presented by Vulturetown Arts, and organized by Chad & Roxanne (the beautiful Willimantic weirdos who created "Art Attacks" in past years), this group show will run until February 20, 2015. Participating artists are: Nancy Olivia Hoffman, Desmond Von Bora, Kacee O'Brien, Devon Lawless, Sky Thompson, Paul Flaherty, Shane French, Robin Ritz, George Hakkila, Donna Nicolino, Dawn Cook, S.L. Johnson, Samantha McGiver, Jim Szarkowicz, Christina Hammon, Joshua Burkett, Mariclare Cole, Amanda Dawn, Jason Borga, Kenneth Saintonge, Nick Scavetta, and Josh Young; with more still to be announced. Live music at the December 13th opening reception provided Sam Moss. The Meteorological Society, Electric Dawn, and George Hakkila. All of the musicians, with the exception of Sam Moss, will also have artwork in the 'CHAOS and JOY' exhibition. The Meteorological Society: Josh Young makes his long-awaited return to Willimantic Records with a mixture of tape loops, records, and keyboards. Electric Dawn: singer, songwriter, multi-instrumentalist; has led Willimantic's own Shrinnirs (formerly known as the Bimbo Shrineheads) since the mid-1980s. George Hakkila: "alternative pop noise folk jangle" influenced by Devo, Captain Beefheart, Minutemen, Volcano Suns, the Girls, and Neil Young. keep a look out for our live shows, renegade art installations and our mobile art gallery. 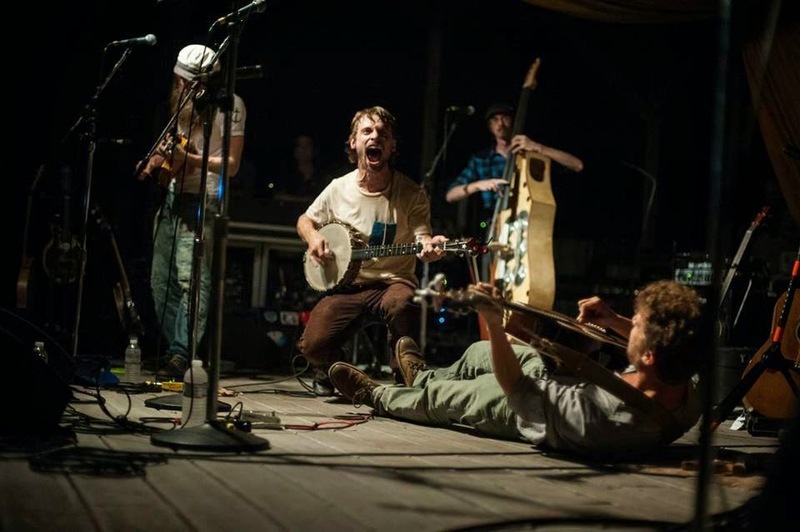 On Saturday, December 13th, 2014 Vulturetown Arts will present an evening with PARSONSFIELD(formerly Poor Old Shine), THE CAN KICKERS, and HANGING HILLS. 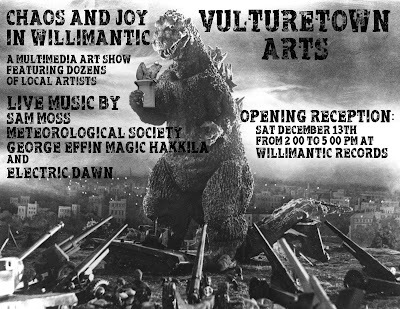 Tickets are available now at Willimantic Records. Tickets are also available online: click here. The Can Kickers are an old time band with drums. They formed in 2000 and have done over 700 shows in the U.S., Canada, Mexico, and Europe. Dan Thompson plays fiddle, Doug Schaefer plays drums, and Daniel Spurr plays banjo, guitar, and sings. Hanging Hills is a folk rock band from Willimantic, CT that is becoming an integral part of the growing scene in the state's quiet corner. They craft songs that are heavily rooted in the past while maintaining a steady foothold in the present, constantly bridging the gap between nostalgia and innocent wonder. Hanging Hills is one of the most talented up-and-coming groups in Connecticut, and always ready to put on a quality, passionate performance. Their debut full length, The Great Divide, is out now.